Two thumbs up for precision, control, and comfort (although you only need one to use the XT452!) 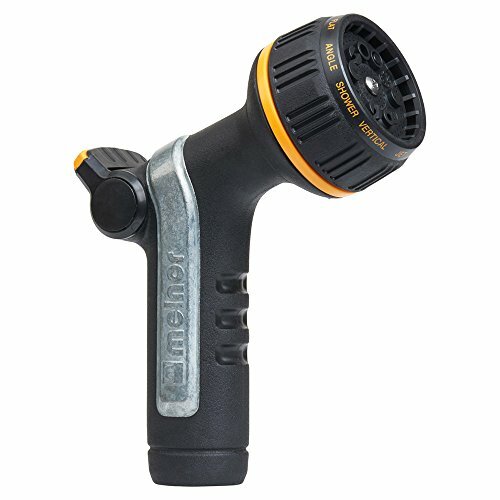 This heavyweight, durable garden hose nozzle puts durability, strength, and the ability to tackle the most challenging of watering chores in your hand. The XT452 features a thumb activated flow control and shut off making it simple to operate. Built tough, with ten different watering patterns to let you water delicate plants and newly seeded lawns, use it as a dog shower to wash off whatever your dog just rolled in, blast dirt from the driveway, create a healthy vegetable garden without creating a swamp, and more. Attaching easily to your garden hose, the multi-spray pattern nozzle can be used for plant watering, a pet shower, a heavy-duty sprayer, a soaking nozzle, a variety of gardening chores and other watering needs. The heavyweight durability stands up to frequent use, and the well-designed watering nozzle features a rubberized, slip-resistant grip that makes it easy to handle and control. Built strong, the heavy-duty metal construction provides durability and long life. In fact, we stand by it with a limited lifetime warranty and more than 70 years experience. Engineered with pride in Virginia’s Shenandoah Valley, Melnor is your trusted brand for the Great American Lawn. The heavyweight metal construction provides a long life for your hose nozzle.